...... 264/AVC, AVCHD, MKV, RM, XviD, 3GP, RA, M4A, MOD, TOD, MTS and more to BlackBerry ringtones MP3. Besides, it allows you to adjust ringtone volume to any desired level for hearing your BB call wherever in a quiet room or in a noisy environment, and then transfer the new created ringtone to your BlackBerry memory card via USB cable automatically. 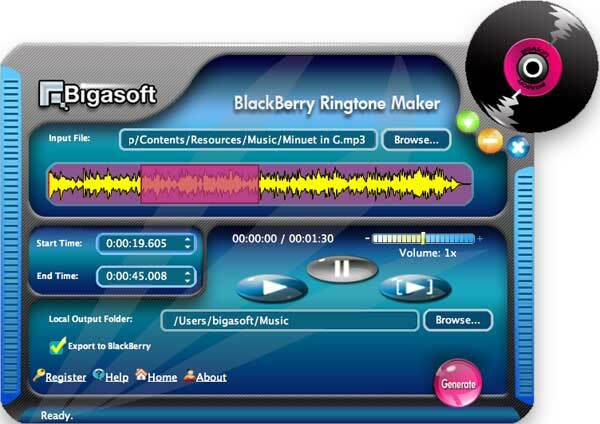 Qweas is providing links to Bigasoft BlackBerry Ringtone Maker for Mac 1.1.8.3852 as a courtesy, and makes no representations regarding Bigasoft BlackBerry Ringtone Maker for Mac or any other applications or any information related thereto. Any questions, complaints or claims regarding this application Bigasoft BlackBerry Ringtone Maker for Mac 1.1.8.3852 must be directed to the appropriate software vendor. You may click the publisher link of Bigasoft BlackBerry Ringtone Maker for Mac on the top of this page to get more details about the vendor.